Westcountry Glass has moved to a new 40,000 square-foot factory, housing state-of-the-art toughening and CNC lines and creating 40 new jobs within the company. The move cost around £5 million and will represent a four-fold expansion in premises for Westcountry. Part of the Cornwall Glass Group, the move will give Westcountry a greater reach with deliveries along the M5 and M4 corridors and enable it to offer bigger units and a wider product range. 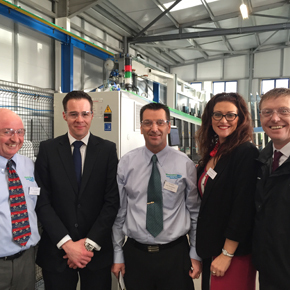 Principal supplier Saint-Gobain Glass is supporting the move with technical support and ongoing product training. In addition, the processor is using several of SGG’s advanced glasses in the refurbishment of the Plymouth-based factory. This includes the use of 6mm SSG COOL-LITE SKN 154 II for the main window refurbishment. Designed to offer exceptional solar heat gain and thermal performance, the glass has a G-value of 0.28 and can achieve an optimum centre pane U-value of 1.0 W/m2K. In addition, 19mm SGG DIAMANT was used to refurbish the reception area. SGG DIAMANT is a highly transparent glass which has very little residual colour. It has a unique appearance and optimum clarity due to its very low iron oxide content. Westcountry Glass completed the move to its new facility at the end of last year, leaving its 10,000 square foot premises in Saltash behind. The toughening plant at the centre of the expansion is able to produce glass up to 2850mm x 4200mm. The plant uses advanced technology to give more uniform and consistent heating. Additional investment has been made in automated jumbo cutting facilities for both annealled and laminated products. Two sealed unit lines now support Westcountry’s growing IGU business, allowing products to be manufactured in house with enhanced lead times. The branch now stocks close to 100 different glass product types.